Pretty much a flawless Traktor controller - the only question is: is it for you? High-quality jog wheels. Instant integration. Fantastic-sounding converters. Size and weight will mean that the S4 isn't suited to every DJ. No user will doubt the S4's intergration or features, it's merely its size and weight that will mean that it isn't for some users. The S4 has no shortage of outputs, something which makes it even more versatile and powerful. All of the functions of the S4 are clearly labelled and easily accessible. Back in 2008, our sister mag Future Music took a trip to Berlin for the launch of Traktor Pro, the coming-of-age overhaul of Native Instruments' popular DJ software. While there, they pleaded for an official controller with everything you see at your fingertips. 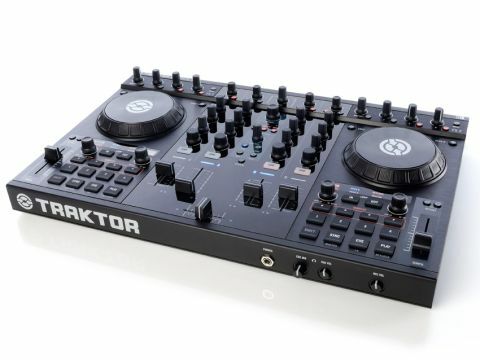 NI gave nothing away, but when the first incarnation of controllers dropped earlier this year, we got excited about the inevitable main event - enter Traktor Kontrol S4. Lifting the S4 out of its box, the first thing you notice is how light it is, considering its size. The S4 is a big beast, and is unlikely to fit in most shoulder bags or even backpacks. "This is a true mouse-less control. The S4 is the best-implemented solution for Traktor we've seen to date." There is a flightcase available separately that doubles as a stand for your laptop and although it's sturdy and is a complete solution, it does add a significant weight to the unit - over 8kg - and comes at a significant price of 169 Euros. One of the first thoughts that entered our minds was, for those of us without tech riders, it's going to be tough to find a spot for this in the DJ booth. You'll more than likely have to invest in a separate laptop stand to sit over the S4, if you don't have the outlay for the official case. That being said, you won't need an extra soundcard so once you've got the S4 in place, it's a simple case of going from the phono or quarter-inch outs to the install mixer. Speaking of connections, the S4 boasts a hefty amount. As previously mentioned, the main outs are taken care of either by two balanced quarter-inch outputs or over unbalanced phono cable. What adds another level of self-containment to the S4 is the option of deck three and four inputs, one of which can be sent to the software to run through the effects or for resampling via Deck C or D or can be sent 'thru' to the outputs, a la any traditional mixer. Anyone who raises their eyebrow at the price of the S4 should definitely keep this in mind as you also get an independent two-channel mixer for your dough. What's also worth mentioning is that the S4 will support time-coded vinyl and CD control 'in the near future'. Though NI don't mention if Traktor Pro S4 will adopt the function, or whether the existing Traktor Scratch will adopt the Kontrol S4, it adds yet another feature for the outlay and could add another two decks of control. The S4 will work over USB-power but will operate at half-brightness - quite an achievement considering the size. Without getting too deep into every control atop the S4's panel, it's worth pointing out the sheer amount of options available to the user. NI have done a fantastic job of avoiding the dreaded shift-function as much as possible, while still making all the important functions easily accessible and all the controls clearly labelled. Once connected, the S4 instantly maps to Traktor, without any preset loading or setups. There are two ways to load tracks via the controller, either by using the Browse knob in the centre to scroll through your tracks and Load buttons beside each jog to cue them up, or by pressing the Browser button, which instantly switches the view to 'Browse View', which makes your library full screen. Use the jog wheels to select tracks and load them into a suitable deck using the 'Cue' buttons. We think this will be the more popular option, as Traktor Pro S4 can be a bit busy on smaller laptop screens, so seeing the whole library at once is a big plus. Once your tracks are loaded, it's time to take a look at the mixer section. If you're a user of Traktor Pro, or indeed have any experience with a traditional mixer, there'll be no surprises here. There's a three-band EQ and one-knob filter per channel, plus an endless Gain knob. We don't love the endless knobs in this case, as you need to reference the screen for your gain settings. The Filter knob works as expected - turn it left for low-pass and right for high-pass. Without an on-off switch though, it can be difficult to reset it in time for the drop, as the only reference for zero is a notch at 0º. Same goes for the EQ, as there is no 'kill' for any of the bands. However, you can use an effects slot for a filter and the FX assign or on/off buttons to cut it right on the money. One section that will be new to veterans is the Loop Recording section. It's straightforward with controls for Record, Undo, Size and Play. Record a four, eight, sixteen or thirty-two-bar loop from the master, cue or aux outputs - nice for returning to sections and as the recording replays after the set length, it's a one-button affair. NI have shouted about the quality and sensitivity of the S4's jog wheels with 1,000 counts per revolution and a patent-pending braking system and after only a few minutes, it's clear why. The top plate is slightly elevated meaning you can push and pull CDJ-style or slightly push down and vinyl mode is activated for scratching or quick cueing. Nothing new, but a very elegant solution and another example of NI doing all they can to avoid the shift button. All that's left are the transport, sampling and looping. Call us suckers for retro styles, but we love the old-skool seven-segment loop length display on the S4. Users of the X1 will be all too familiar with the one-knob looping function - simply rotate left and right to set the length and press down to turn it on and off. The screen above lets you know which deck is the master, if keylock is switched on, if samples are loaded and if the deck is 'On Air' or not. It looks great, and has a clear readable display in any lighting. We'd have loved to see the track's waveform pulled through to a screen like this, but maybe that's asking too much. Probably the biggest change in the new Traktor Pro S4, and thus the Kontrol S4 too, is the newly implemented Sample Deck. The new Sample Deck offers four 'slots' per deck to store a currently selected loop for replay later. What makes this different to the Cue or Cue loop storage is that the samples are replayed on another channel. This allows for the sample to be effected, filtered and EQ'd independently of its source, but you do have to sacrifice a mixer channel. To store a sample in the Sample Deck simply activate a loop and press an available Sample Deck slot button. NI have hinted that this function is more suited for one-shots, effects, loops and hit samples by including some in the new S4 library. Loading up white noise builds or appropriate drum loops and fading them in and out with their own filtering and effects assignments blows open Traktor's performance potential - not forgetting you can resample the mic input too. With Beatport's DJ Tools section in full swing and Loopmasters releasing their DJ Mix Tools series, it's safe to assume this kind of 'filler' material will only grow in popularity thanks to this new feature. 'Intuitive' is a word that continually cropped up in both the Traktor Pro and X1 reviews and is definitely a suitable label for the S4. Anyone even remotely familiar with either Traktor Pro or its current controllers will feel at home straightaway with the S4. This is true mouse-less control and you'll find yourself forgetting completely about the laptop screen. The converters sound fantastic and - running it incredibly hot - we were particularly impressed by the depth of the low end. The S4 is, without doubt the best-implemented solution for Traktor we've seen to date. However, that's almost a given. Due to the reputation NI have created for themselves, the majority of Traktor Pro, Kontrol X1, Scratch or even Maschine users will already know the S4 is a quality product before they even try it. For beginners, the price is maybe too high, despite the self-contained and intuitive approach being appealing. For touring DJs, the fact that the case will add 8kg to your luggage and that the booth footprint is substantial, may turn you off. Mobile DJs, on the other hand, will love the S4 as a one-off self-contained solution. This doesn't mean it's not completely suitable for any of the aforementioned scenarios, we just feel it will be an individual circumstantial decision rather than a mass adoption by any one group of Traktor users. One thing is for sure, if you do take the plunge and commit to the S4, you won't be disappointed. Traktor users are now officially spoiled for choice.